Because the recent post, Allan Truax, A.E. Housman, The Ex, and Me, proved unexpectedly popular, I am publishing this Allan1 Truax addendum although it consists – so far – of only a few unrelated bits of information. This should take care of that annoying popularity. What sort of guy, I wondered, living in an isolated North Dakota town in the early 1900s, would buy a volume of Housman? This initially rhetorical question soon led me to track down information about him. And, it turns out, A.L. Truax was an extraordinarily accomplished sort of guy. His job was in the railway mail service, but his heart and mind were given over to his involvement with his community and church, his extensive travels, and his devoted pursuit of his intellectual interests, especially horticulture, literature, and family, local, and American history. Allan was an avid reader and music buff and gardener. He had a complete library in his home with many old books. We inherited all his books and took good care of them, but during one move to a new home, we needed to dispose of some, which we gave to a book seller. That is the source of your book. He wrote his name in all the front covers. By serendipitous stumbling around the internet, I discovered that, in addition to his interest in poetry, history, and genealogy, Allan Truax had an interest in mycology,2 including collecting and contributing at least one specimen to an authoritative collection. She corroborates the story of ‘Yelles’ skating across Franklin Pond, Vt. on his 100th birthday, says the ‘young folks’ let him beat them across just to please his vanity. Also told about bear he tamed. Says they would entertain him free of charge at the Farnham P.2 fair and the Franklin Co. Vt. fair just for the stories he would tell. Once while at the Farnham Fair he overstayed the limit of his ticket and his friends feared he couldn’t get back. He said he would show them. When the conductor came around to collect tickets and told ‘Yelles’ his ticket was n.g., the latter began to jabber at him in Holland Dutch. Of course no one could understand him. They sent for a Frenchman and he could understand Yelles’ jabberings no better, so finally the conductor said ‘Oh well, let the old fool ride. He’s crazy anyway’, and so he got back to Franklin. Ice skating to celebrate a 100th birthday? Bear taming? Calling someone an “old fool?” Sounds like a AllanShowalter.com post to me. The email exchange with Allan Truax’s grandson, Roger Truax, and Roger’s wife, Rosalie Truax described above eventually led to the receipt of additional historical data and family photos that I will soon be publishing. 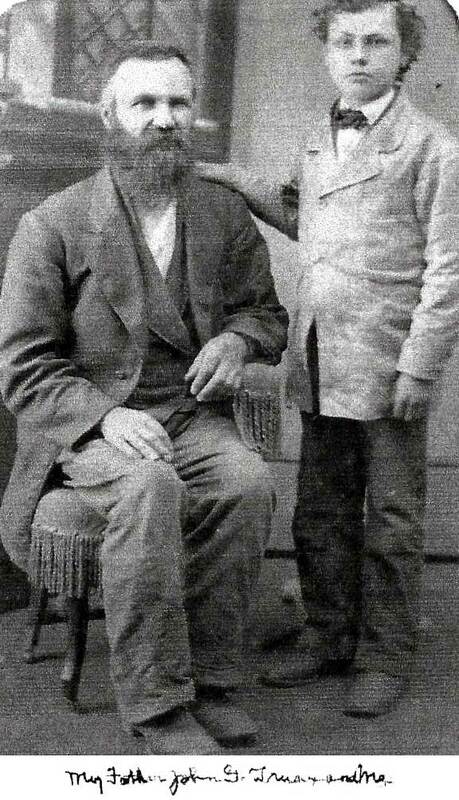 One of those shots, the photo atop this post, features Allan Truax at 10-12 years of age and his father, John G. Truax, If my estimate of Allan’s age is accurate, the photograph was taken in the early 1880s. While it may be no more than artifact of the photographic style of the times or the need for longer exposures, Allan’s bearing as a child, I’ve convinced myself, presages a life of purpose, self-reliance, and competence.